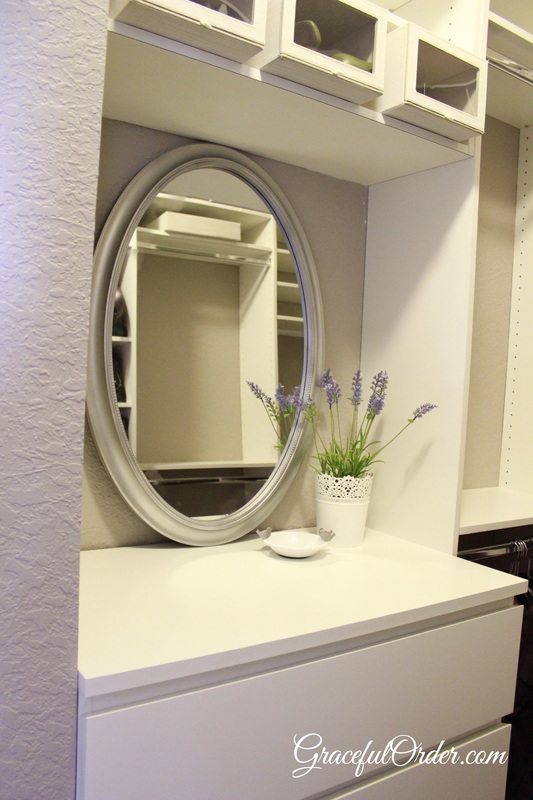 The last two weeks we have talked about the master bathroom, and shared ideas about creating storage in small bathrooms, I also painted my laminate cabinets and organized under the sink. But now, let’s step into the master bedroom. 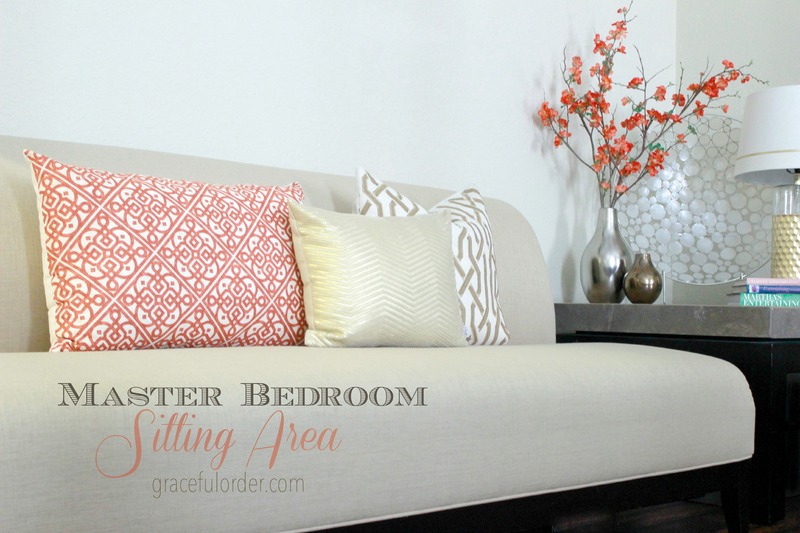 Creating a master bedroom retreat is our project this week, and I want to share with you some decorating ideas. The master bedroom should feel like a hug. Creating a master bedroom retreat is so rewarding because after a hectic day, you want to go into a space that says “peace”. My favorite bedding is all white because it has a casual, welcoming feel. I never try to make my bed perfect, I even like the wrinkles. I don’t think I have ever said those words before, but I do. They add to the casual, inviting feel. And it works because my boys always seem to feel that they are “invited” into our bed. 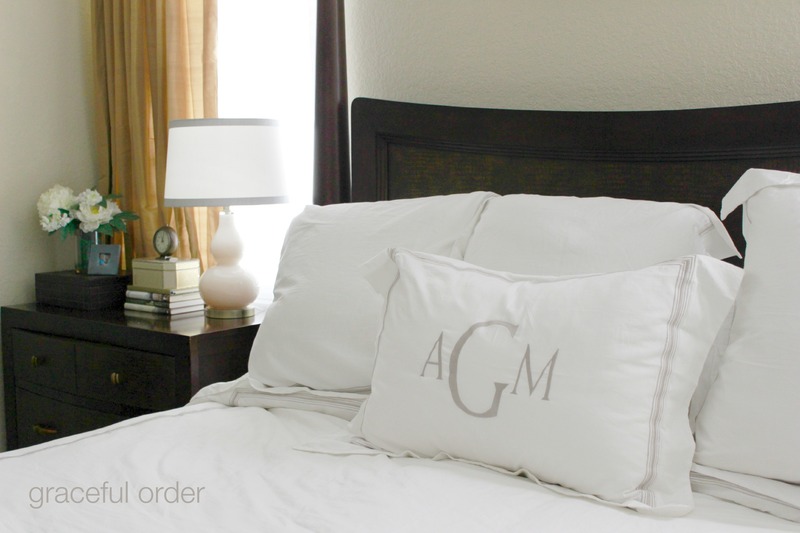 I purchased this bedding from Ballard Designs and I LOVE the large monogram. The sheets are not fussy-looking but they feel luxurious. Monogramming has a bad rap for being stuffy, but when paired with cotton, it’s just an elegant touch. On the foot of the bed, I place a throw. Honestly, we rarely use it but I think it warms up the room. 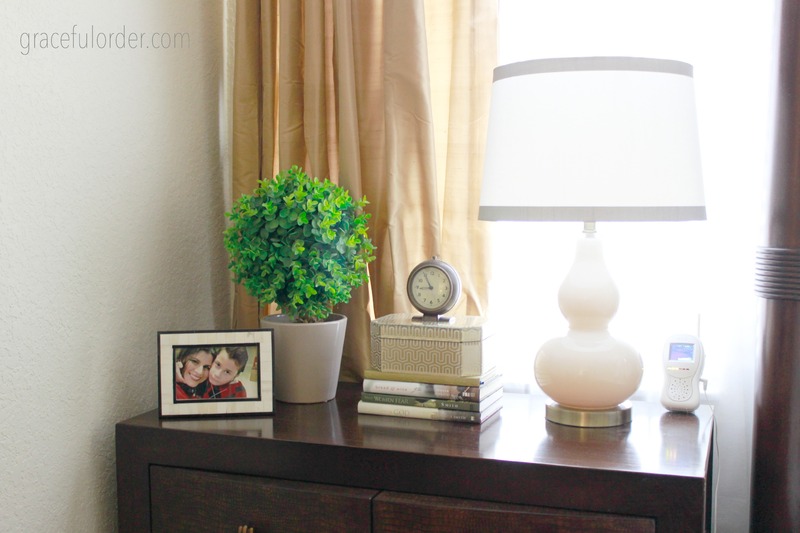 Our bedside tables are large and thanks to that, we opted for a sitting area instead of a dresser. I love this lamp and shade, both from Target. In this picture the lamp was off, but the sunlight was flooding in. 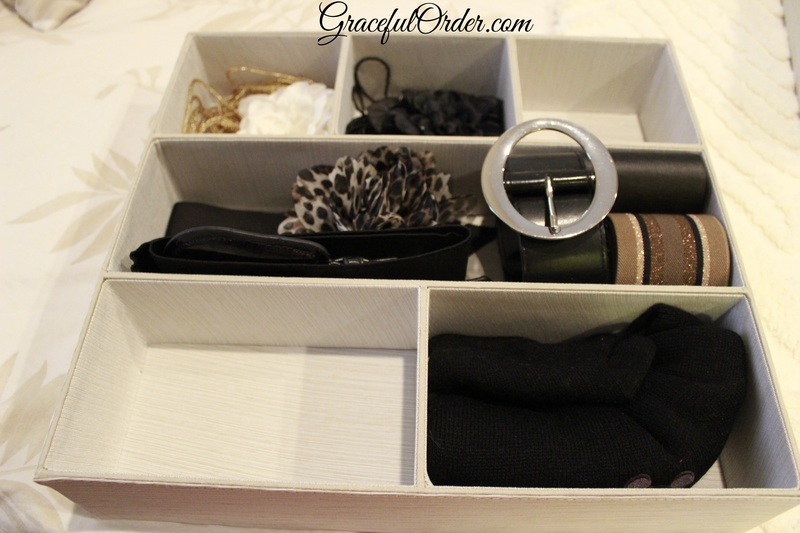 My husbands nightstand has a valet box where I store all the little papers and receipts that he brings home. 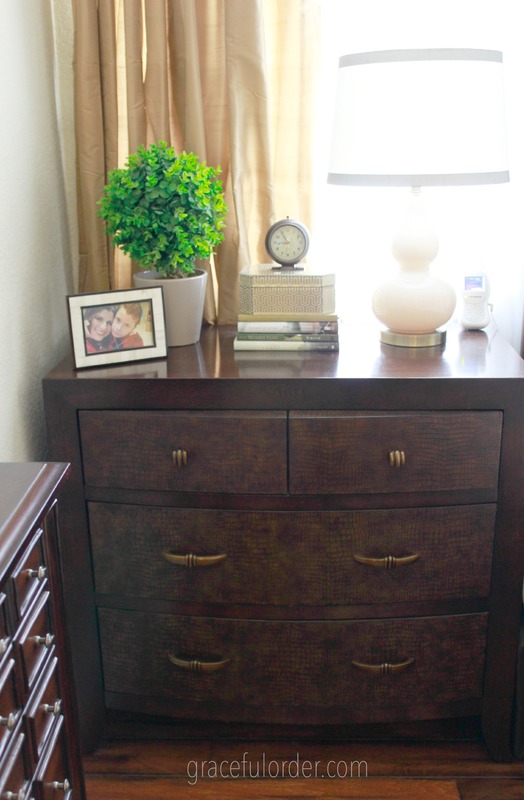 Otherwise, the nightstand would be covered with receipts and business cards. 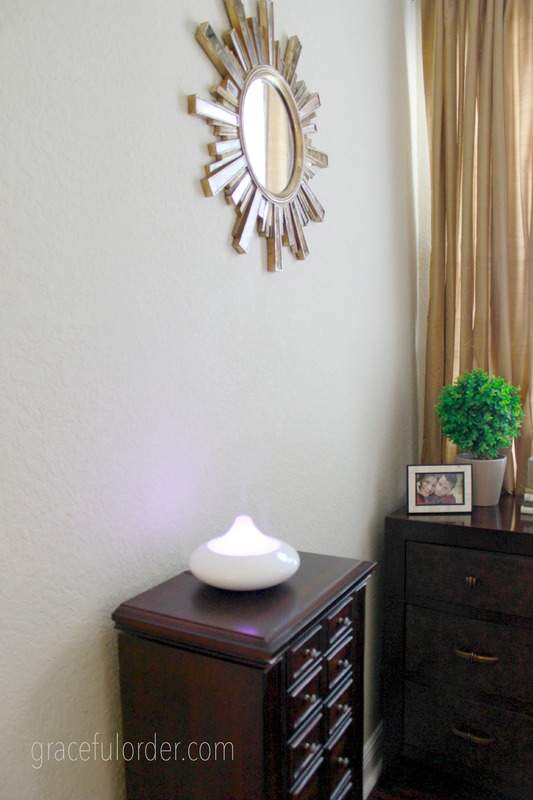 I love having an Oil Diffuser in the bedroom to disperse lavender and eucalyptus. Bring the spa-feel home! 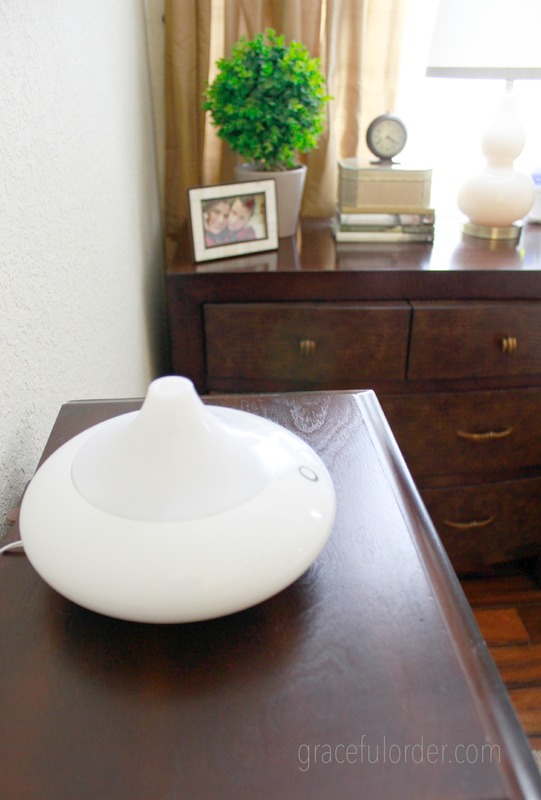 Right now, the Oil Diffuser is resting on my jewelry cabinet. 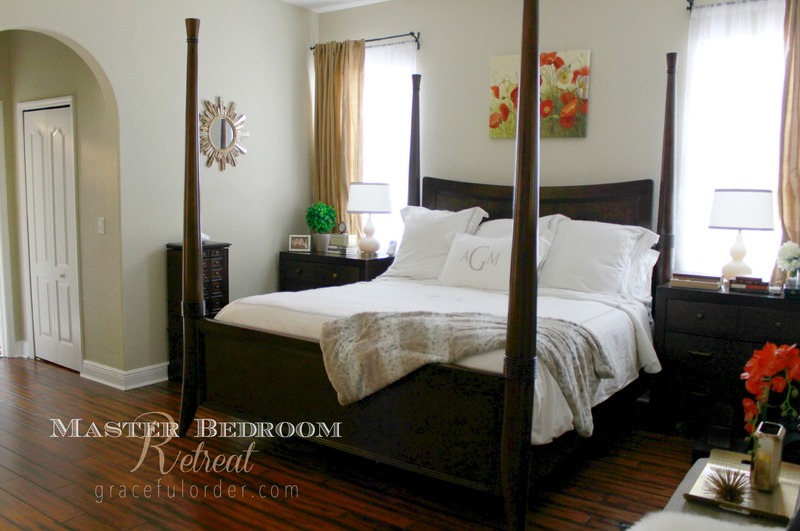 There are a few steps in creating a master bedroom retreat. 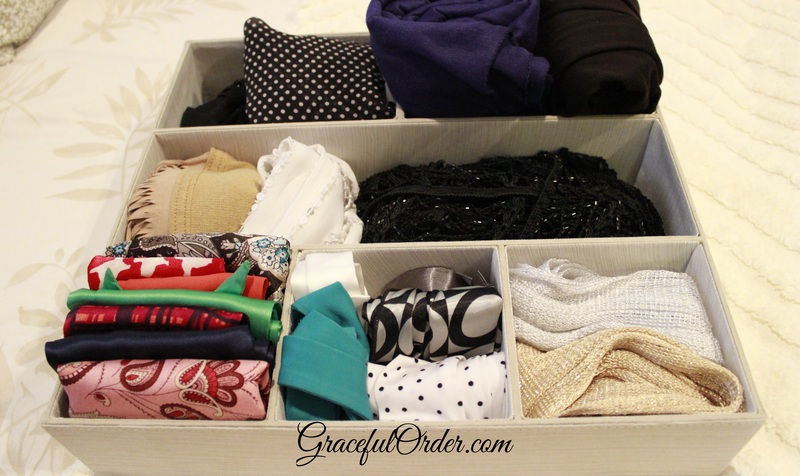 Clear the clutter from the night stands. They become the “catch-all” in the bedroom and get messy fast. Clear items from under the bed. I used to store stuff under the bed and I have to admit, it was just a big dust magnet. Most of the stuff I had under the bed, I should’ve either thrown away or made space for it in my closet. 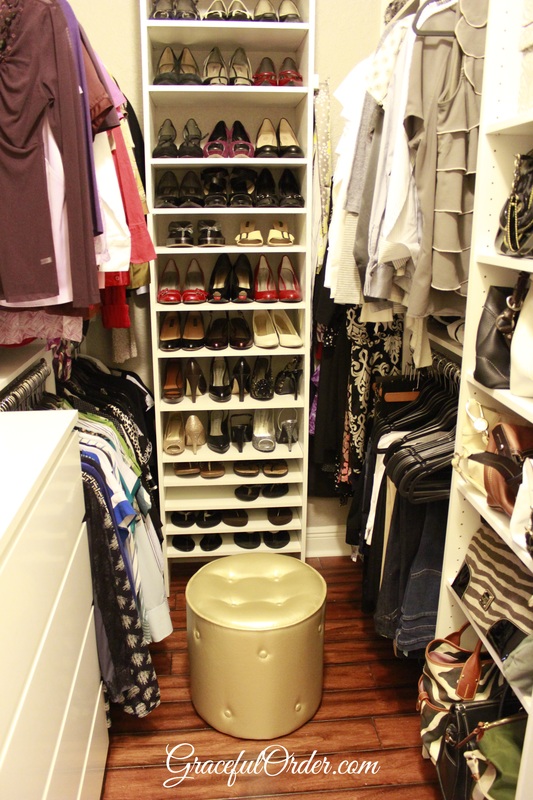 If you can, clear out this area and it will be so much easier to keep the room clean. I am glad I did this years ago. 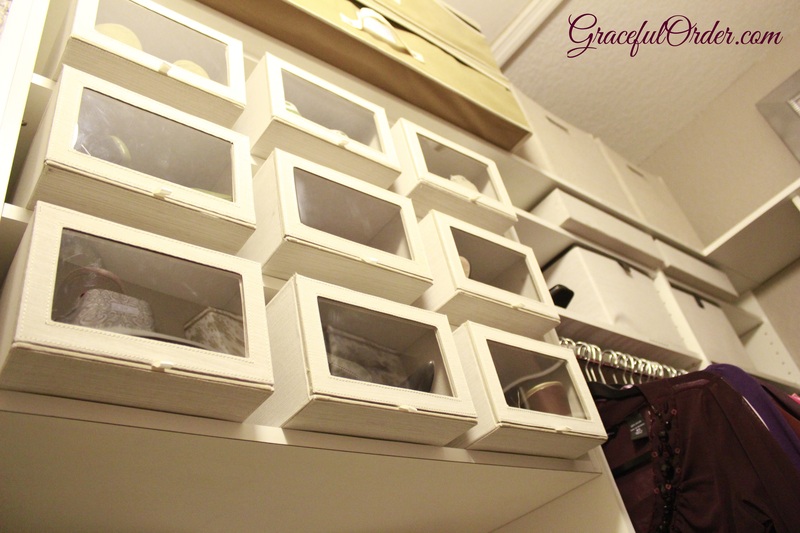 Decide what “look” you are going for and get rid of decorations that don’t match the “look”. 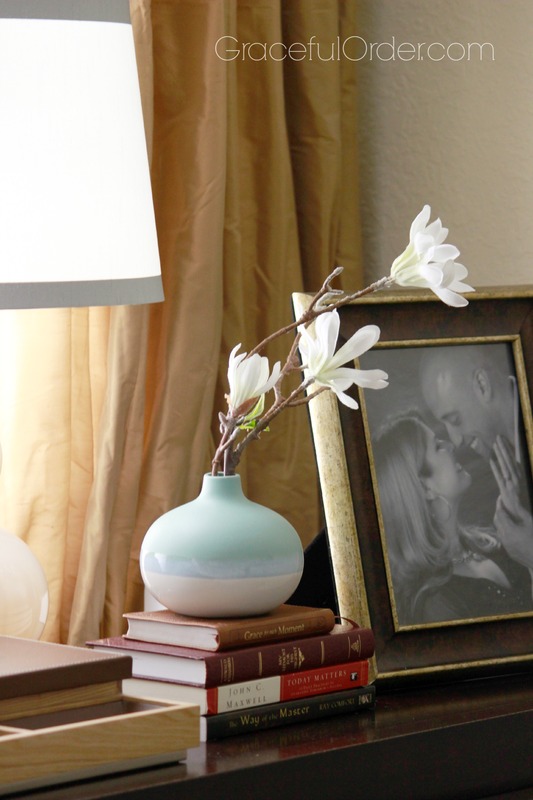 Sometimes you need to shop-your-house and bring in items that you already own and love into your new space. 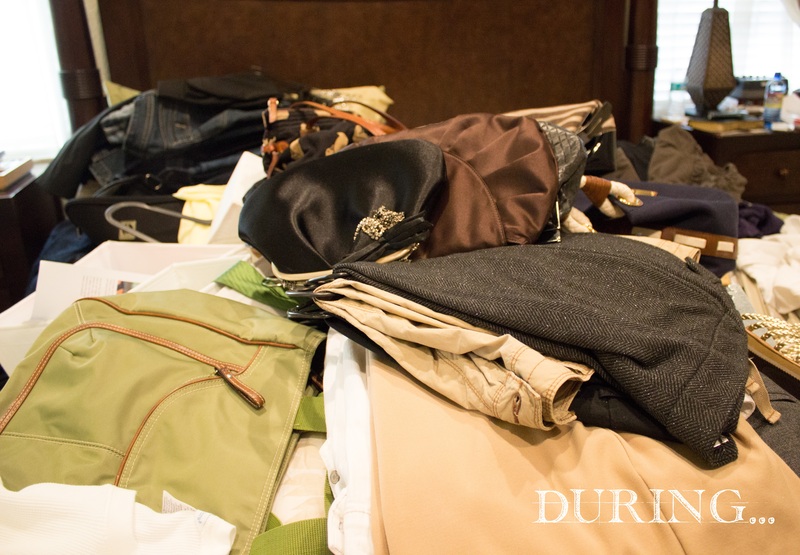 The biggest investment (besides furniture) and the one that will make the biggest difference, is the bedding. Splurge on nice sheets. They last longer and therefore more economical in the long run. I look for a comforter that is washable since the boys love to jump on our bed. White comforters are my favorite because I can always add color pillows if I want to add a pop of color. For now, all white is my favorite. Have the books that you are currently reading out on your nightstand, but not an entire set of encyclopedia next to your bed (do you still have those by the way? I do). 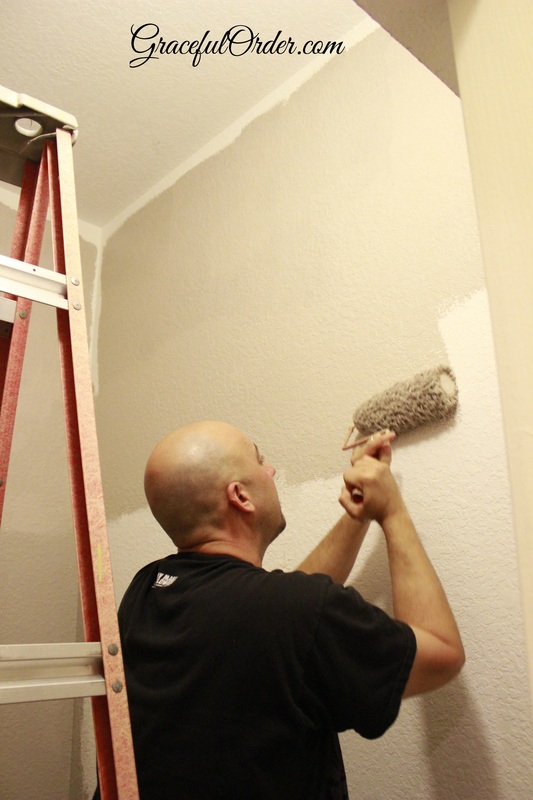 If you are going to go all out and paint the walls, choose a color that is relaxing. Skip “Peacock Green” and “Magenta Madness” for this project. The next thing on my list (which we still don’t have) is purchasing a nice rug for under the bed. We have wood floors and I would prefer stepping onto a plush rug when I get out of bed. I know it will be a finishing touch to our bedroom and also add an added layer of comfiness. 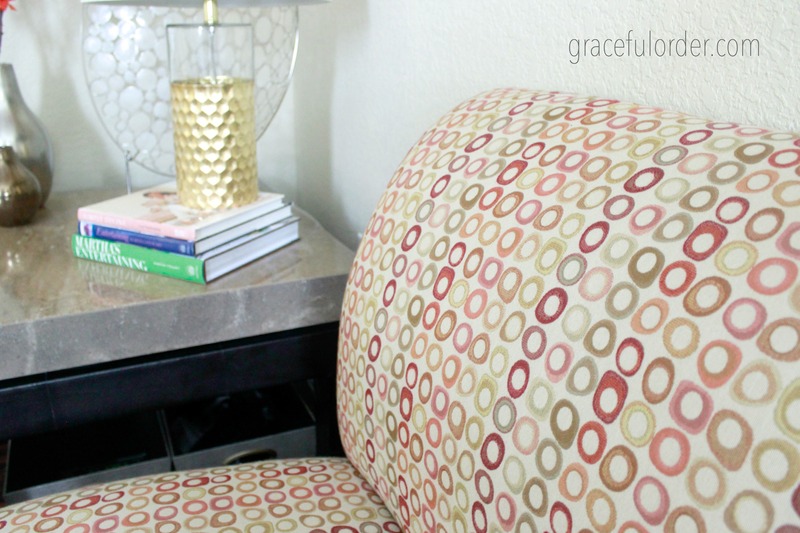 Soon we will talk about creating a seating area and how to use ottomans in bedrooms. 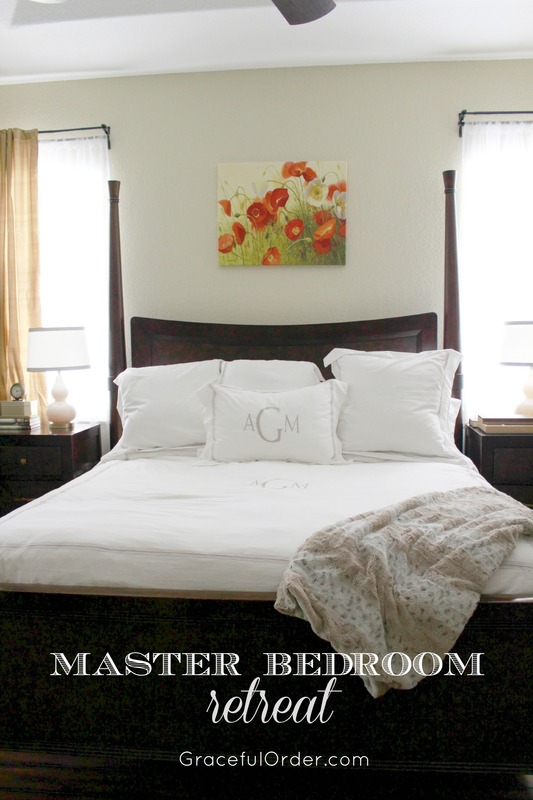 Until then, please share with me your favorite color scheme for the master bedroom. 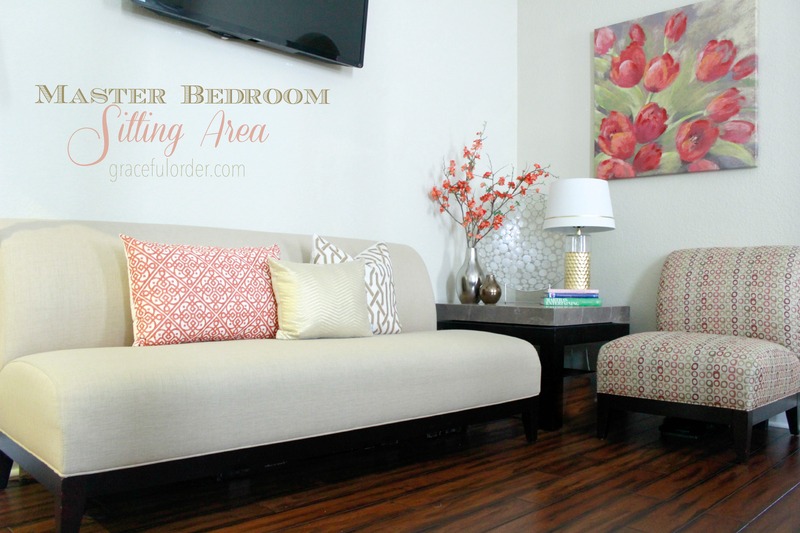 Is your bedroom decorated in warm neutral colors, do you prefer cool tones, or just pops of vibrant color? I look forward to reading your comments! 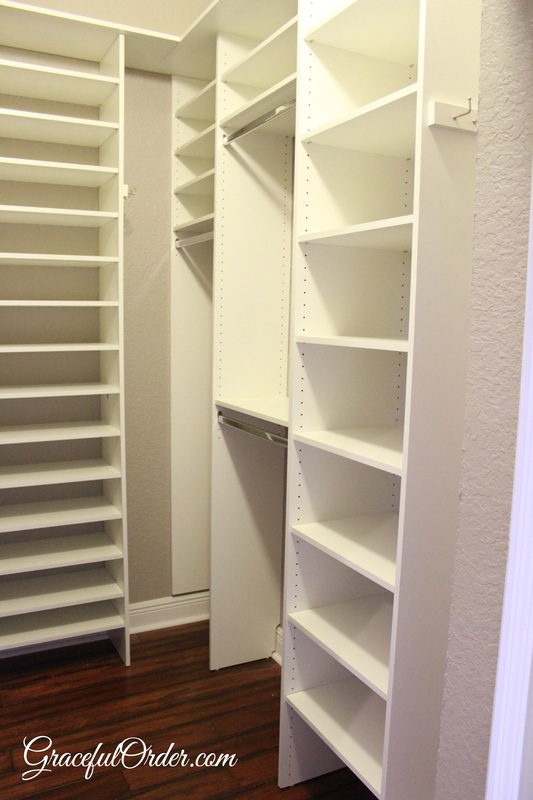 Getting shelving installed in the master closets has been on the “honey-do-list” since we moved in 9 years ago. In the meantime, I had a mix-matched “system” of shelves that were on clearance at some point and I tried to do the best with what I had. 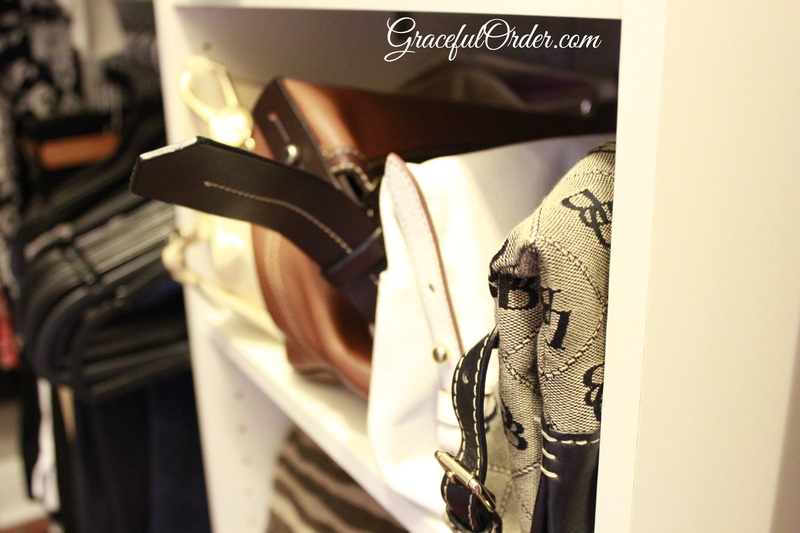 Earlier this month, we finally gave ourselves the green light to move forward with my closet. 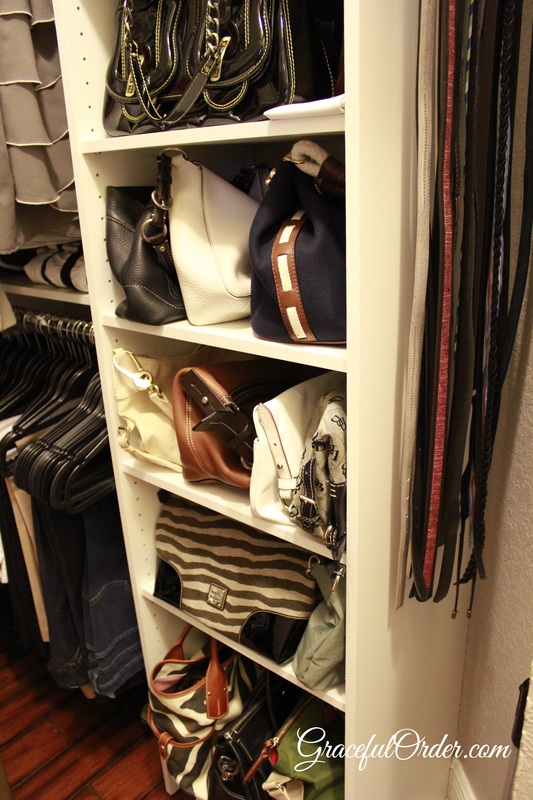 My husbands closet will wait a bit. The shelves were dark and made the space look smaller and as you can see I didn’t have enough shelves for my things. It was organized chaos. Nothing “Graceful” going on in there! I got everything out of the closet. 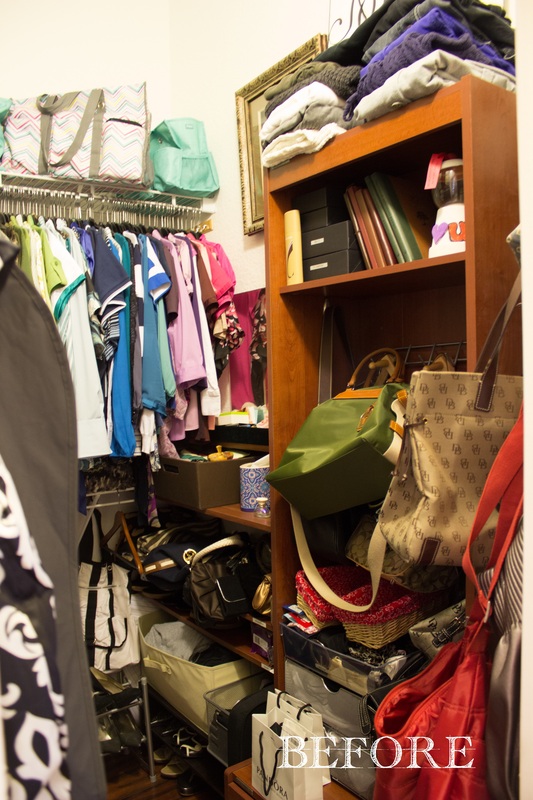 The perfect opportunity to get rid of items that needed to be tossed or donated. Needless to say my room was a mess for days. 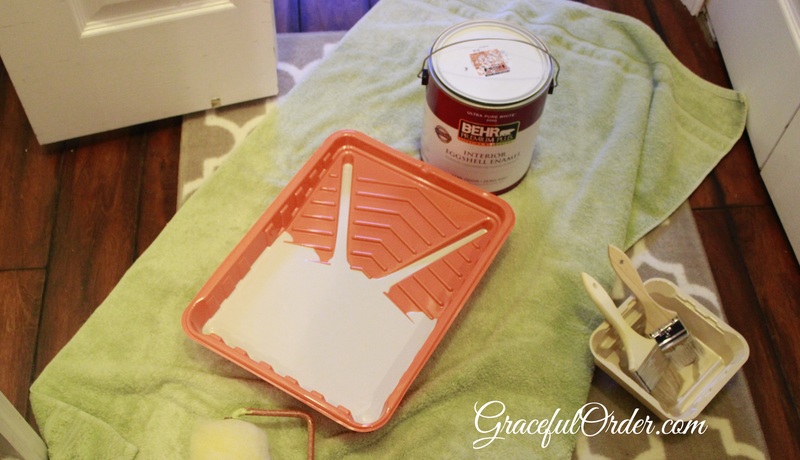 I knew I wanted to paint the closet walls since I had chosen white cabinetry. My husband tried to “sell” me on the idea that we should leave it white. He is smart and avoids having to pull out the big ladder. I told him not to worry for one minute. 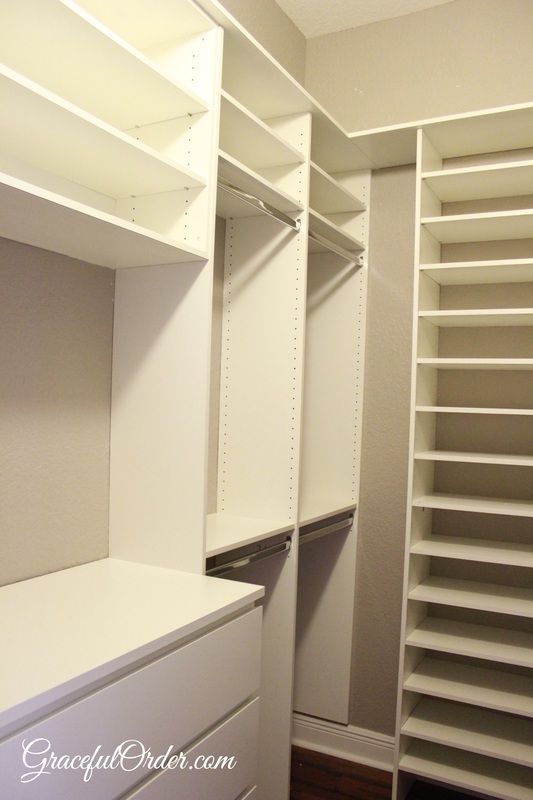 I would paint the closet all by myself. ALL. BY. MYSELF. 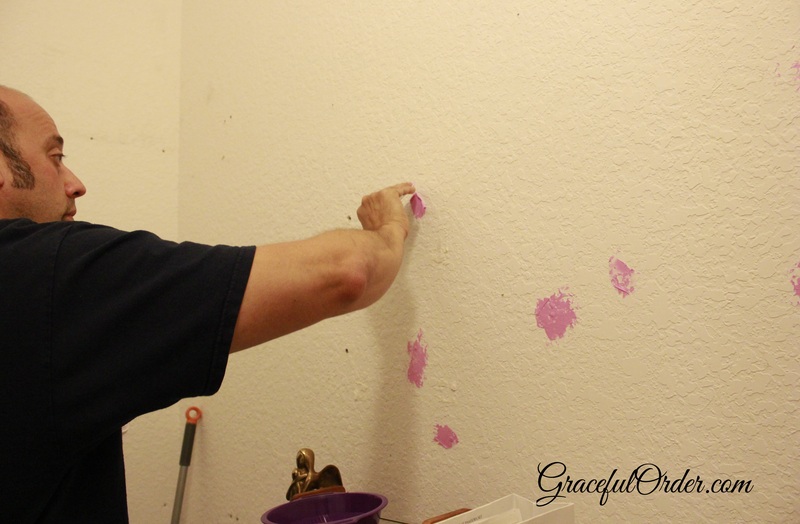 So he helped me by patching up the holes in the closet, which were many. As soon as that dried, I happily embarked on my painting project! 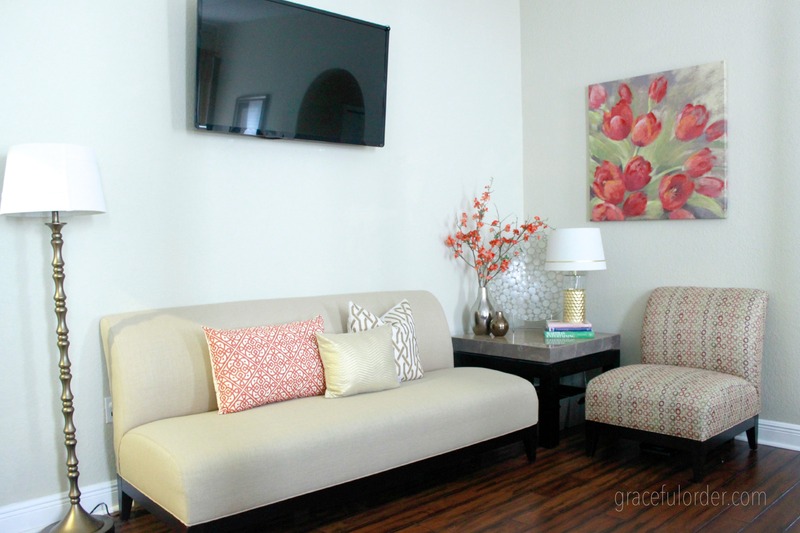 The color that I chose was Behr’s Graceful Gray. It really was my favorite gray and the name was a total coincidence! I have painted walls on my own before so I wasn’t at all intimidated. 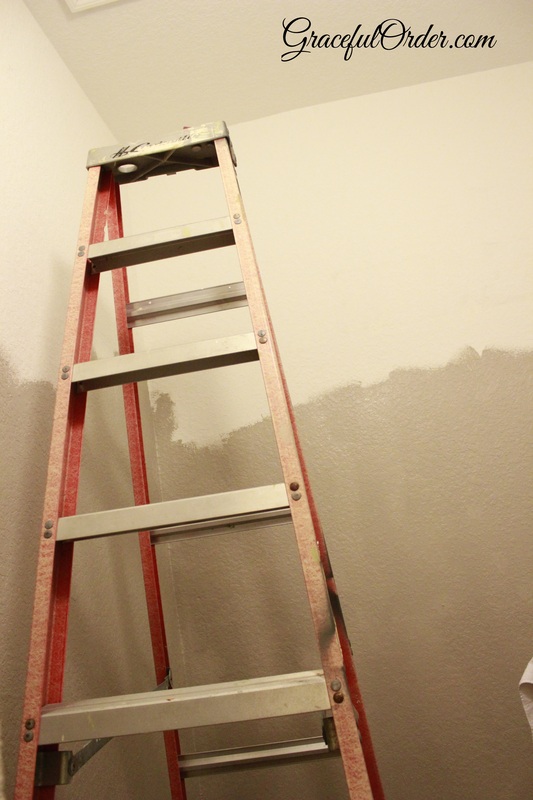 I painted the bottom of the wall and then pulled out the ladder and started on the trim. And then…I ran out of steam with two walls left. And that’s when I whined…ALOT. I am not above whining. And it worked. He loves me. That man loves me. I kept doing the trim but he helped me with the roller which was great because my arms were hurting so much! So we were done in no time. We just waited until the next morning when the cabinetry was scheduled to be installed. I couldn’t wait! I was so happy to see it come together! 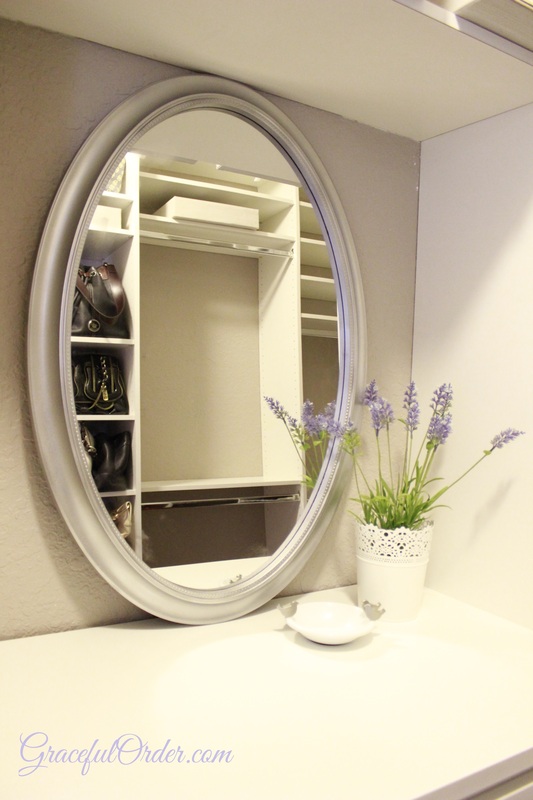 I left a big space on top of the small dresser (from IKEA that we had previously to the install) so that I could add a big mirror and bring a little charm to the closet! 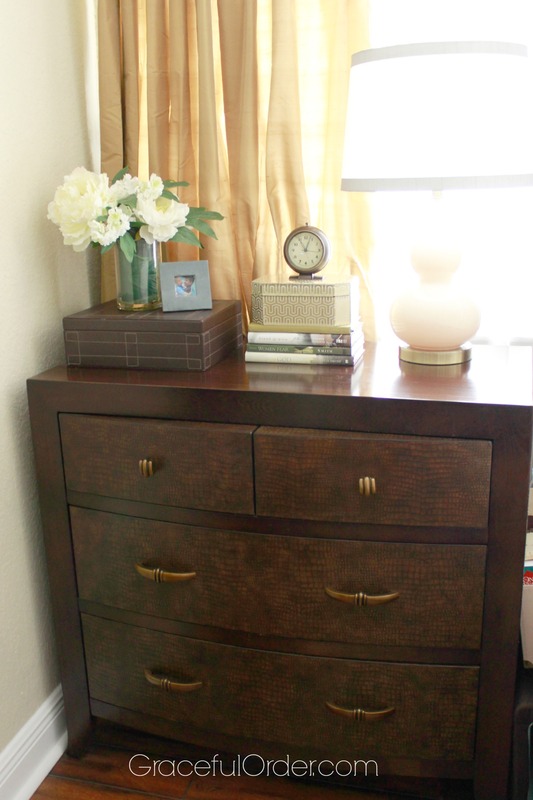 The dresser looked like part of the cabinetry that had just been installed. I was so happy that it was a perfect match! 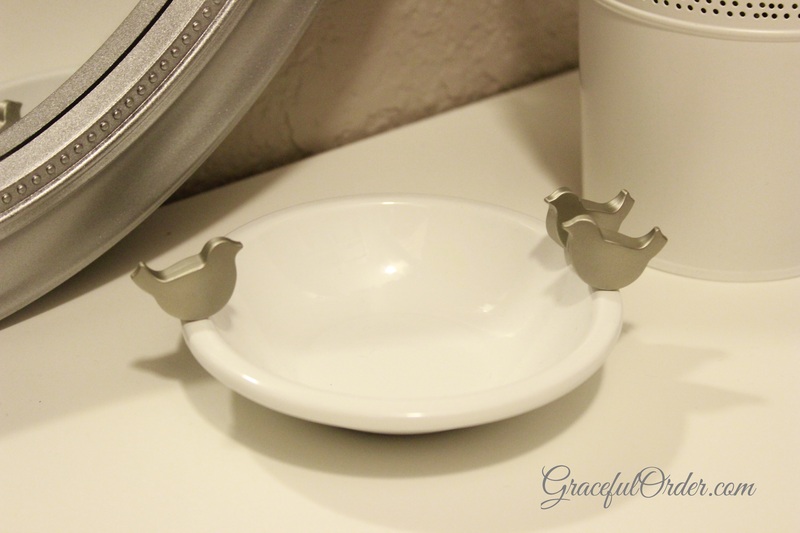 I found this little tray for rings and I thought it was perfect. And it looked great alongside the little plant from IKEA. Time to add the clothing! 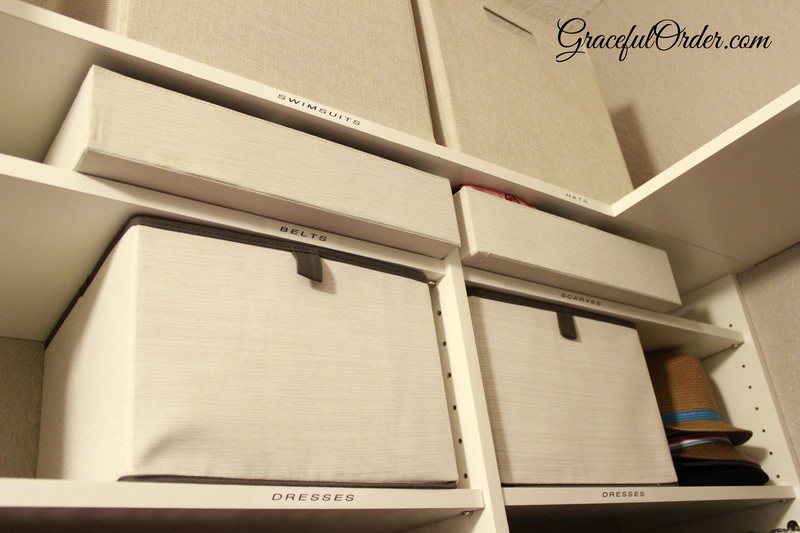 I added them in a color coordinated manner which is how I had the closet before. 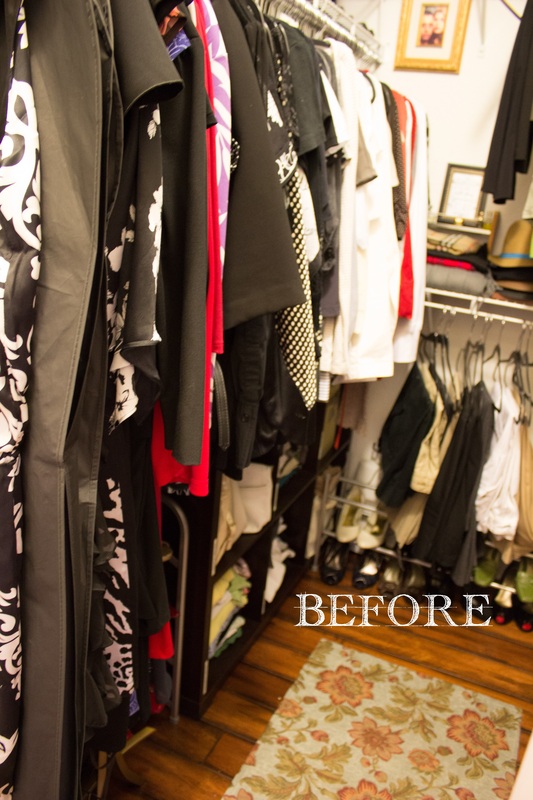 It takes a while to do initially but it makes the closet look so much better and its easier to find what you need. 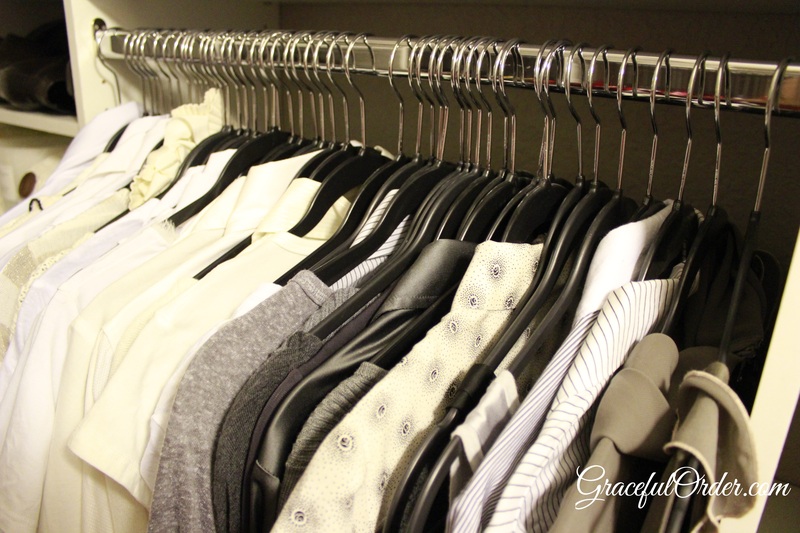 All my hangers are from Crate and Barrel. I am not a fan of felt hangers. I prefer smooth hangers so that clothing slides off easily. These are slim, plastic and really inexpensive. 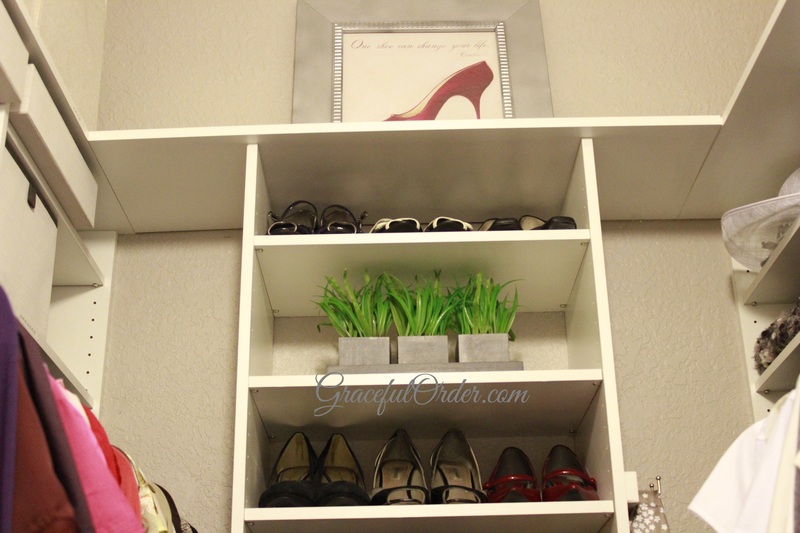 Shoes that were rarely worn I placed in these boxes from Target. They are from the Threshold line. The rest of my shoes are in the very center of the closet. 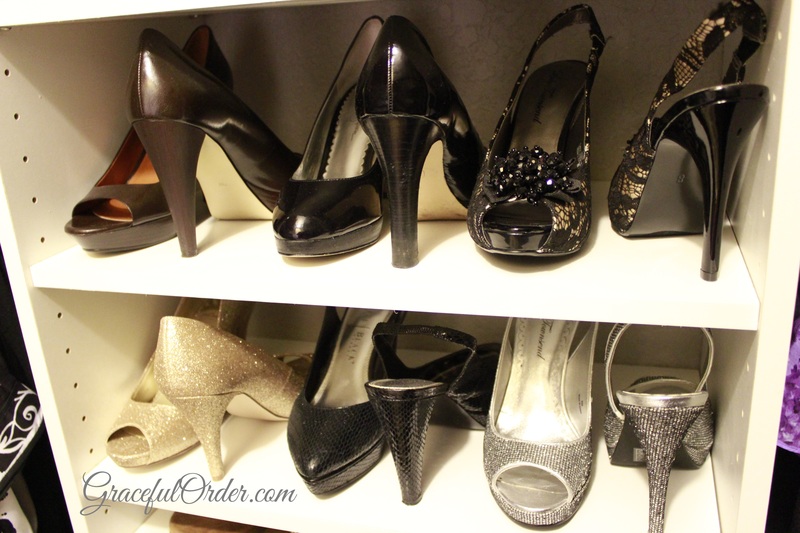 I did have to get rid of some of my shoes in order for them to fit but it pushed me to purge items that had been taking up space in my closet for years! Am I the only one whose feet have grown after having kids? I used to be a size 7 and now I am a 7 1/2. 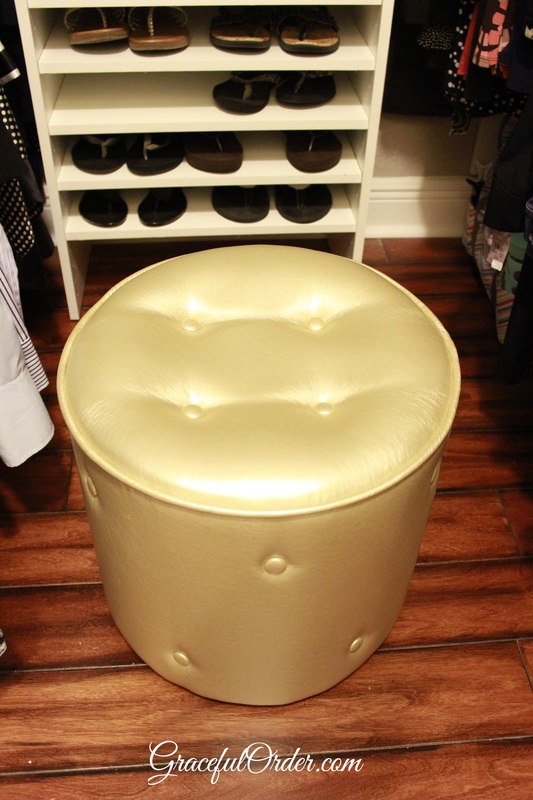 I wanted a chair or a bench to sit on while I put on my shoes and this one was large and small enough for the space. Also, it is extremely light-weight and easy to move about. In the top I have a couple of bins. I labeled the shelf instead of the bin. Small scarves or fabric belts. My purses also have their own spot. I folded over some of them in order to fit more per shelf. 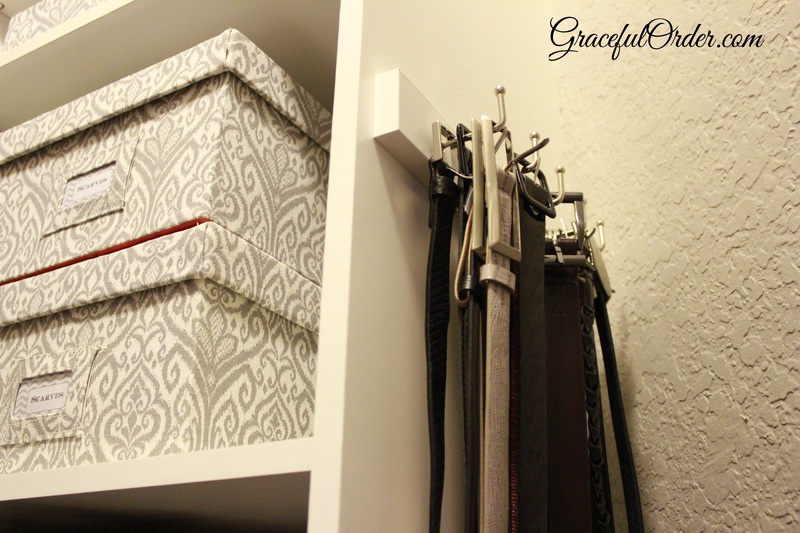 I now have a belt rack attached to the cabinet. This frame was definitely the finishing touch. I had it for years tucked away behind a couch and I spray painted the frame to match the rest of the closet. The quote says “One shoe can change your life” by Cinderella. Shakespeare didn’t have any shoe quotes. In the other end of the closet, I put away boots, chunky scarves…and other things that Miamians buy just for looks. 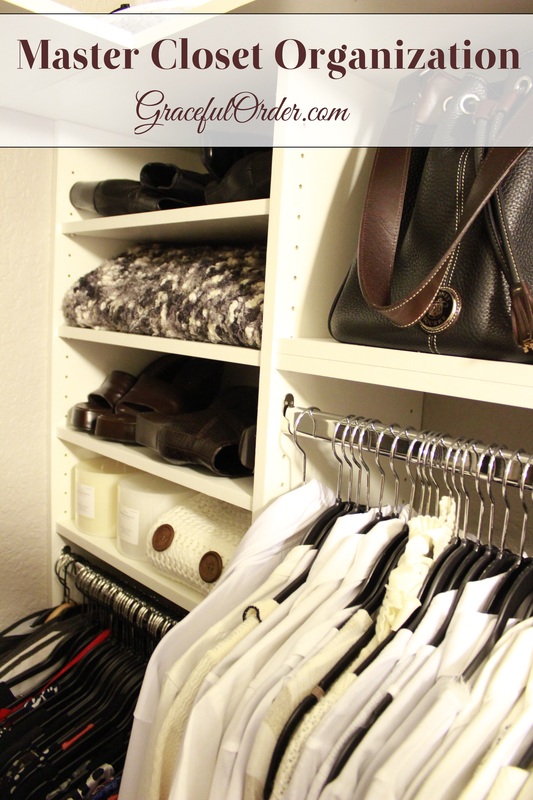 That’s the closet! I am so happy with it! I waited to have it for so long and now I am that much more appreciative for it! 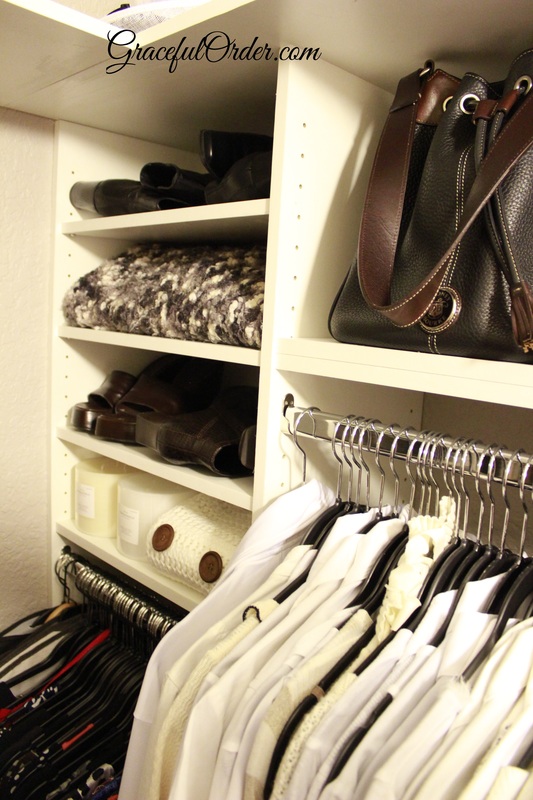 My husbands closet is next. I think he should leave it white.